nVIDIA's new NF3-250 Athlon64 chipset addresses all the issues people had with the original NF3-150. For starters, the NF3-250 is a single chip solution like the NF3-150, but it now natively supports four Serial ATA drives as well as SATA RAID! By default "NVIDIA RAID" supports the usual RAID modes 0, 1, 0+1 and JBOD. 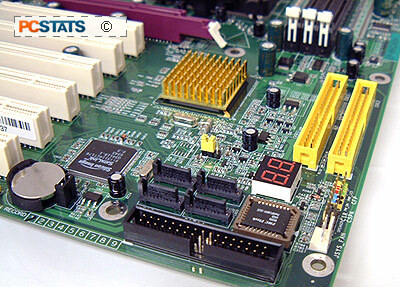 One very cool feature is you can mix and match IDE and Serial ATA drives in a RAID array up to a maximum of four Serial ATA devices, and two IDE. While I doubt the vast majority of end users will take advantage of Gigabit ethernet any time soon, many were not pleased that the NF3-150 only included a 10/100 MAC. nVIDIA has gone all the ay this time, their onboard Gigabit NIC does not run on the PCI bus, like most traditional Gigabit NIC's, rather it runs on its own private bus very much like Intel's CSA Gigabit Ethernet! The 10/1000 NIC still requires a PHY, the Cicada SimplyPHY in the case of the Epox 8KDA3+. Something new has been added, and that is the nVidia Firewall - a hardware based solution built into the NF3-250GB chipset. nVIDIA have also increased the number of USB 2.0 ports from six (on the NF3-150) to eight for the NF3-250 chipset. Apparently nVIDIA has optimized the NF3-250 for use with their own videocards as well, of course that does not mean non-nVIDIA based videocards won't run. One feature that we really like about nVIDIA's nForce3-250Gb is the onboard hardware firewall. With more people jumping on broadband, it's important to safeguard your PC against possible worm/hacker attacks. nVIDIA has taken it upon themselves to include a hardware firewall with their nForce2-Ultra400Gb, and nForce3-250Gb chipsets which should protect their users from possible attacks. To access the Firewall functions you simply double click on the "nVIDIA Web-based Interface" icon on your desktop, or in the programs menu and that will bring up the above window. nVIDIA has organized their Network Access Manager into three different categories; Ethernet, Firewall and Administration. Clicking on any of the headings or links in the main window changes the menu to the left. For instance, selecting the Firewall setup gives you the following options shown above. You can use nVIDIA's defined levels which is recommended, or configure things yourself. The hardware firewall allows you to configure what ports are opened, closed or in stealth mode. Once changes are made, the network interface needs to be restarted. Simply give your PC a few minutes and you'll be all set. If you suspect any suspicious activity you can always look things up in the firewall logs. Please note though, the onboard hardware firewall is not enabled by default, and you will need to access the Network Access Manager before this feature is turned on. Once the nVIDIA hardware firewall is turned on it should protect your computer against the most common attacks.